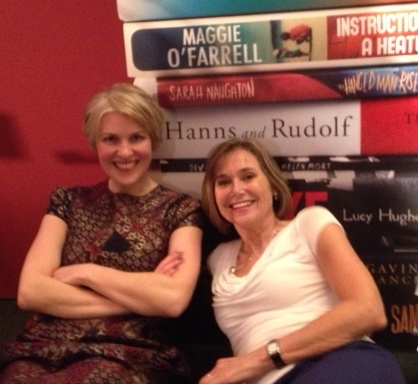 Last night I was lucky enough to attend the Costa Book Awards party with my lovely agent, Eve White. For those of you who dream of being a writer I’d like to say KEEP TRYING, because it really is an awful lot of fun. It was a great party in many ways (free champagne, etc) but here’s my list of the best bits. Nathan Filer snogging his wife’s face off when he won. Meeting the authors and judges (esp Ross Montgomery and Philip Womack). The reading from poetry winner, Michael Symmons Roberts’ book, ‘Drysalter’. Ian Hislop chortling avuncularly (is that a word?) when I interrupted his conversation to introduce myself (okay okay, it was after glass number 4). The goody bag containing Kate Atkinson’s ‘Life After Life’. The obliging Quaglinos staff chopping the huge display board in half so I could take it home on the bus. The canapés that looked exactly like spoonfuls of yellow vomit. Nathan Filer only being 32. *Untrue. She was there but she maintained her dignity throughout.